When companies work on sustainability they are rarely inclined to contemplate the structure of their current business model. Any action related to sustainable development needs to fit within their current system of activities. Changing the model to become more sustainable is usually not worth the investment in the short and medium term, and is thus not pursued. Rather, companies prefer to work on incremental changes to improve on sustainability where they can, steering well clear of the root of the problem which lies in the impact that flows from their current business model design. What is the reason that companies seem so unwilling to opt for radical change, even if it were for the better? With this blog I would like to share some thoughts. Part of the answer is revealed through Clayton Christensen’s theory of disruptive innovation and the role value networks play. A value network comprises of interdependent value chain actors, from sourcing to marketing. This network of actors is pieced together to provide for the product or service features, which are defined by carefully listening to customer demand (which ultimately closes off the value network). The value network is thus the context within which the firm responds to customers’ needs. All activities by each member in the value network, are geared to deliver on the requested product features as efficiently as possible. A value network knits all the different business models of all the participating value network members together. In practice the interrelations can be so strong that the composition of a value network is formed as a hierarchy which mirrors product or service architecture. This value network is visualized by Christensen as a nested system, where each part of the value chain fits into another one like a Matryoshka doll (original can be seen in the Innovator’s Dilemma, 38-39). 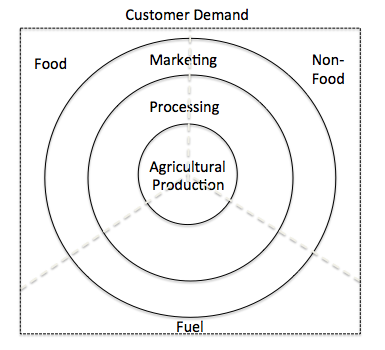 I’ve made a slight alteration to Christensen’s figure by drawing out one for the agricultural system, changing its shape to show how different uses, or purposes for the use of agricultural production [food, non-food, fuel] shape the hierarchy of a value network. If you consider the value network of local food, then you are dealing with something totally different than when you’re looking at value network that belongs to conventional agriculture. It’s just not possible to take out one part of the value network you don’t like (eg. lack of scale in local food distribution), and replace it with a bit that you do like from another system (large distribution from conventional agriculture). Most companies are thus “locked” in their interdependent value network, and couldn’t change their business model to become more sustainable even if they wanted to. Christensen describes this impossibility very well by analogy to the components of computers, where components belonging to the mainframe computers (physically) can’t fit into the architecture of the mini computer. Both technologies, even though the same in nature, belong to very different value networks. The upshot is that value networks can only keep innovating along the same line of improvement of those business models that befit their network. This is what Christensen calls sustained innovation. It could provide part of the explanation of why companies usually prefer to stick to incremental change when it comes to sustainable development. Through disruptive innovation it is possible to challenge existing value networks and replace them with new networks with new business models. However, you often see that these disruptive business models are no guarantee that business will deliver on sustainability. In order to understand why value networks, even though they can be disrupted, will rarely changes in terms of delivery on sustainability, we need to consider a second value system layer: one which expresses the overall order of values which permeate throughout the value network. Let’s call this value system order. I have taken the liberty to use the figure below to depict value system order, taken from the MIT Sloan Management Review. Again, the value system order is a nested system. 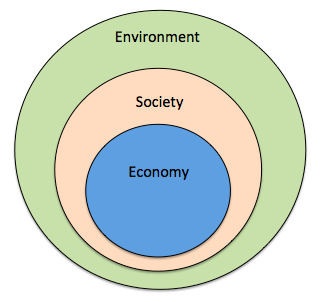 Ideally the sustainable value system order consists of a well-proportioned spacing between the values of economy, society, and the environment like the one below. If the value order prioritizes economy over the environment, like for instance in conventional agriculture, the order will look different, something akin to the next figure on the left. Any choice made for business model innovation in this order of values will result in this proportion of delivery on sustainability, regardless of whether we’re talking about sustained innovation, or disruptive types. 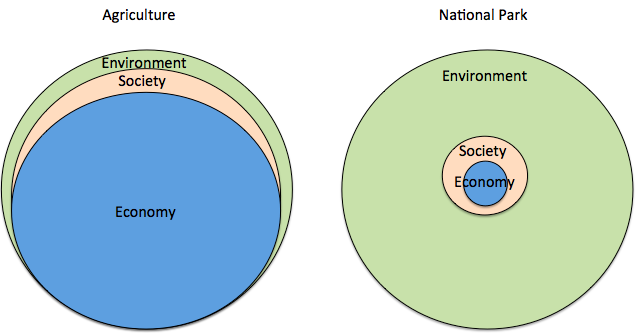 If you look at the design order of a contrary example, a national park or reserve, then sustainability will look something like the figure on the right. The choice here is always for models which take lots of environment into consideration, link to society but more limitedly so, and the economics of it all is quite negligible. The main point is that the value system order provides guidance for the designing the hierarchy that you want to implement in the actual value network that operates the value chain. Each value system order will result in a corresponding set of value system hierarchies and business models, which deliver on sustainability according with the proportion of the order. If you look at the relation between the role the value network plays in business model innovation in combination with the value order proposition, we can now argue why existing industry finds it so difficult to deliver on sustainability. They might be willing to reconsider the value order (commiting themselves to sustainability covenants, like the World Business Council for Sustainable Development), but they soon find that they are not ready or able to disrupt their own value network with a different network design hierarchy that will deliver on sustainability in line the with desired value order. So what might be the alternative? Though still a budding sector, the alternative might lie in the social entrepreneurship sector. Social entrepreneurs practice innovation alchemy, where new business models are designed from an uncompromising value order perspective, but fully flexible in the design of the corresponding value network. This article in Forbes explains along these lines how social entrepreneurs are hacking capitalism. In practice you will find that social entrepreneurs are using their alchemy in an attempt to disrupt incumbent value networks, and replacing them with more sustainability oriented ones. Regardless of the promise of social enterprise, sustainable change in any case, even from incumbent industry, will need come from the same process. This is a process where firstly a clear sustainable value order is chosen, through which new value network hierarchies are consequently designed that are able to challenge the old capitalist system. Combining both will create the type of disruptive innovation which is needed to transform an industry’s practice to a more sustainable design. – it is more likely that those companies will be social enterprises than existing multinational publicly listed enterprises.